Some four years ago, I gave a 5-star rating to a duo collaboration between French pianist Benoît Delbecq and Canadian clarinettist François Houle for their album "Because She Hoped", a great result of years of collaboration. 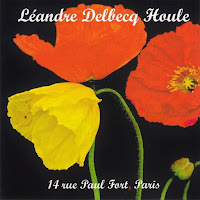 On the other hand, the collaboration between Léandre and Houle also goes back for more than a decade and with four albums so far, and they are also easy to recommend. They now form a trio on this magnificent album, and I think it's even the first album on which Léandre and Delbecq collaborate, so even in that respect it's a historic moment to have two of France's most distinguished improvisers on the same record. And they do not disappoint us, quite to the contrary, they create music that is all their own, an eclectic mix of jazz and free improv with classical elements and even folk music as their basis. What we get here are three musicians who are among the best you can get on their respective instruments, and at the same time innovators and musical visionaries, now giving us this mature and fresh music, offering versatile and open improvisations with moments that can be qualified as meditative, impressionist, dreamy, mysterious, full of intense lyricism and wonderful spontaneous harmonious developments. Sounds are predominantly as can be expected from each instrument, although timbral excursions do occur, especially by the piano and the clarinet. The recording has furthermore the intimacy of chamber music, and that's literally what it is, having been performed live as a private home concert, which explains the address of the title. And even despite the limited setting, the music still leaves lots of open space, moments of silence surrounded by just one or two instruments driving the improvisation forward, with caution, accuracy and audacity. Despite the overall sense of sadness and melancholy, they also alternate with moments of fun and playfulness, as on the fourth track, or as on the sixth track, when a folk melody is used as the basis for free fun. In sum, this is a real treat, performed by three magnificent musicians who sculpt a common sound out of thin air, beautiful and sensitive and free.